Discounting the new pages and fixes generated for TD2E, this is the first New Art since September of 2008. More to follow – given the nature of this particular project, you’ll be seeing new strips on the DCR website before they show up here. Strip 141 – I never stopped working on DCR, at least on paper. The story is in good shape. Production, though… I became distracted. Distracted, and numb. It’s been 18 months and a couple of weeks. Or two months and a few days, or five months to the day – it depends on how you look at it, if you consider TD2E to have been actual production or re-production, how much of the recent downtime is weighed as slacking or an actual well-earned decompression after six and half years of working 8-16 hours a day, 7 days a week (37.5 hours on the day job, the rest on The Dualist, Transitional Voices, DCR, etceteras). The next three strips – with this one, the next page of DCR The Comic – will be ready to start with a bit of work. That bit of work takes place this week – updates to a couple of CG dummies and shot framing for three strips. After that, more CG – as I’ve mentioned elsewhere (awhile back), getting the next few pages done will require the creation of 90% of the CG that DCR requires. As of some time tomorrow morning, the bits in my EVE skill queue will be measured in days, as opposed to hours or minutes. Time to stop grinding for ISK and standing – time to start using the PC for its intended purpose again. So, a few updates in the near future. Then a pause. Not as long as the last one, I hope. Then more updates, on a more regular basis. Comments will be enabled until the next strip or the spam hits, whichever comes first. 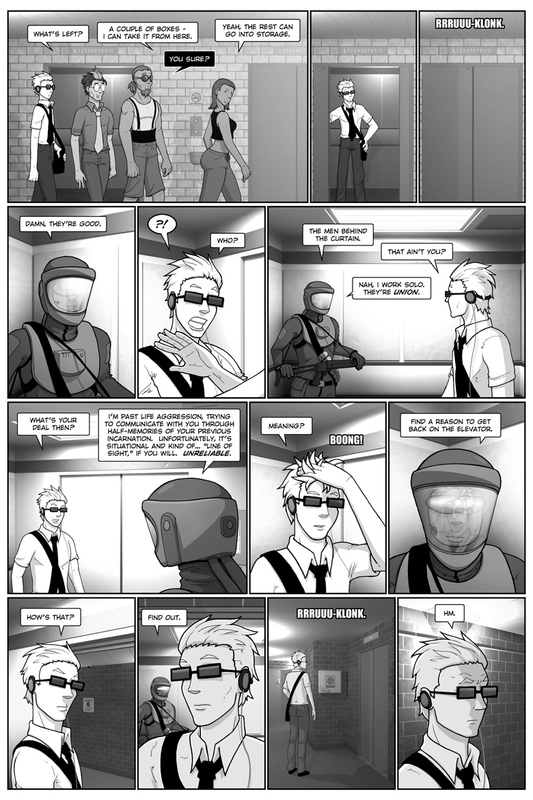 Strip 142 – Note the lack of a SAG-compliant face-illuminating internal headlamp. Yesterday: 3d mockup of the spacesuit helmet and yoke, grenade launcher, etc. Transition from old “woody” biped to new home-brewed biped for CG positioning etc. Rendering and assembly of panels. Today: Meeting with Mike, then pencils, inks, cleanup and shading. Took a bit longer than expected but them’s the breaks – a spacesuit with a bandolier of grenades is a bit more effort than I’m used to. Backgrounds for the next strip rendered. Tomorrow: Assembly of the next strip. Pencils and inks and so forth, I hope. Rendering of the strip after for sure. Two strips in three days – remember when that wasn’t a record? Strip 143 – Three for four. The next strip is rendered and ready to pencil – if I wake up early enough, I should be able to grind it out tomorrow. Pencils and inks at least – either way, New Strip Number Four should be up this weekend. I hear there’s a cream for that. Strictly speaking, not a “bad art” strip. But not one I’m entirely happy with, either. Incentive to keep at it. Make the next one better, etc. 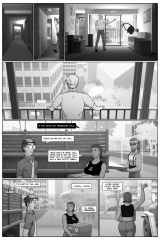 Strip 144 – Renders Friday, pencils and inks Saturday, shading today. 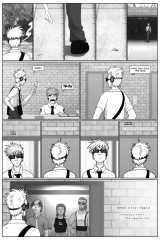 A full new page for dcr.atc in a few minutes. That’s it for the time being, unfortunately. I’ll set up the base templates for the next page of strips and render what I can, but halfway into the next strip I’ll be out of CG and it’ll be time to start modeling again. I intend to keep things as simple as possible – streamlined to save me headaches, simple to keep with the established background style. I’ll try not to go overboard, and I’ll try to bang out strips as the CG becomes available – this may result in some visual inconsistency. Hopefully, it won’t – we’ll see. If things go ridiculously well, there’ll hopefully be one more strip in April, with more regular production starting in May. Mastering notes, 2016.12.05 – Tweaked dialogue in panel seven, tried to salvage panel nine. It looks better than it used to but it’s still the weakest shot on the page. Aggression. Seemed appropriate given the circumstances. 120 queries in 0.880 seconds.